The poet Prosdocimo needs inspiration for a play. When local beauty Fiorilla attempts to start a liaison with the handsome Turk Selim (despite the fact she already has both a lover and a husband) he thinks he’s found his subject. But are things getting out of hand? Moshe Leiser and Patrice Caurier set their production in Italy in the late 1950s/early 1960s: the time of an explosion of glamour and comic romance in Italian cinema. The sets are brightly coloured, the costumes elegant and provocative. Some of the more farcical scenes – Selim chasing Geronio round an Italian café or the ball with male chorus in ballgowns – are reminiscent of Federico Fellini at his most madcap and upbeat. Rossini and his librettist Romani based Il turco in Italia on an earlier libretto with the same title written by poet Caterino Mazzolà (the librettist for Mozart’s La clemenza di Tito). The plot owes much to the Italian tradition of commedia dell’arte, particularly character types (such as the cuckolded husband and the flirtatious young woman). The character of the poet Prosdocimo encourages us to treat the drama with a certain irony. The hilarious plot of Il turco in Italia inspired some of Rossini’s most sparkling music. Highlights include the trio for Prosdocimo, Geronio and Narciso ‘Un marito scimunito!’ (complete with a quotation from Mozart’s Così fan tutte), the lively Act I finale, with its build-up of characters and arguments; and Fiorilla’s bravura Act II aria ‘Squallida veste e bruna’, which she sings when she becomes convinced all her men have deserted her. Il turco in Italia all but disappeared from the repertory during the latter part of the 19th century, as Rossini fell out of fashion. It came back to public attention in October 1950, when Luchino Visconti staged a production for Maria Callas, who was keen to play a comic role. The production was so successful that the opera’s popularity grew rapidly. 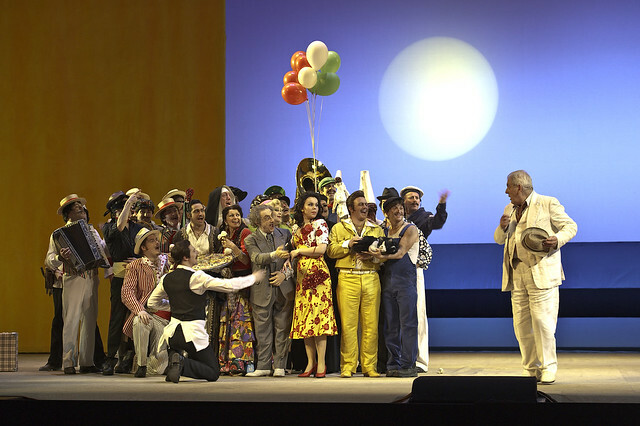 Moshe Leiser and Patrice Caurier's production of Il turco in Italia was The Royal Opera’s first; it had its premiere in 2005 and was revived in 2010.